There is a debate raging now about whether plain jane, text based emails work better or if “newsletter style” emails with lots of pictures work better for getting opens in email marketing. At least there is between my “email guy” and me. I started this project with my flag firmly planted in the “I like pretty emails so that is what I am going to do” camp and he said that my emails were ridiculously long and cluttered which was keeping me on the promotions tab in Gmail. From you I like pretty emails. I think your Marketing Artfully header adds a personal (because your photo is part of it) yet professional dimension to your emails. I find plain text hard to get by the second paragraph, I prefer bullet points and pix! The only thing I would ask is, would it really hurt to have a header? If you have ever sat down to create an email marketing campaign you know the feeling of…hmm wonder what I should write, how should I order it and how do I track what I have already gotten done. I know I have! Which is why I made this email marketing campaign form! 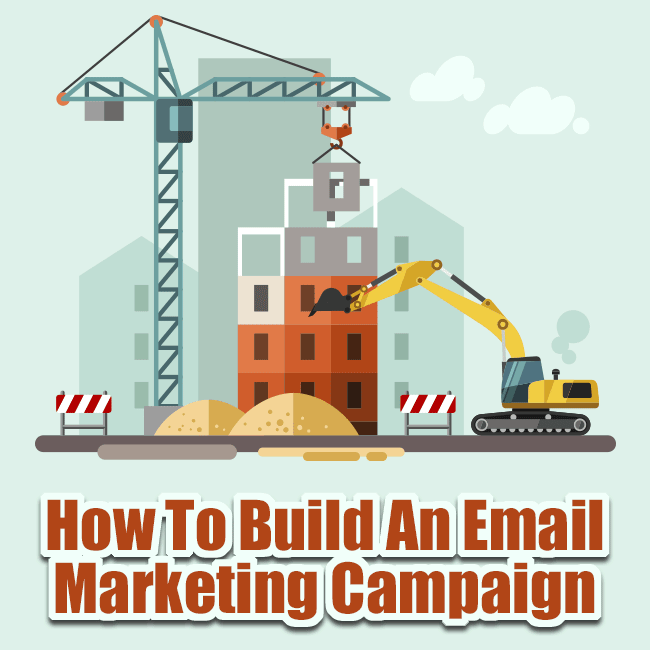 It takes you though all the steps of doing an email campaign… get the course! I like pretty stuff, but maybe “simply pretty” would be a good mantra! So here is a comparison between the email that I sent and one of my “normal” emails. 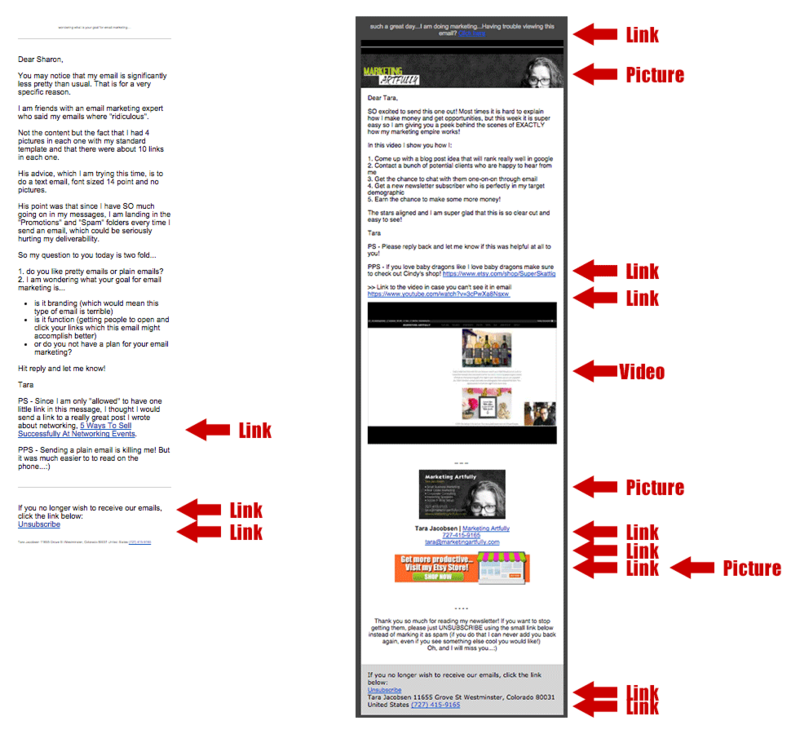 There is one “extra” link in the plain one and the two that Infusionsoft requires. There are 8 links, 3 pictures and one video in the “pretty” one. Hmmm now that I see all those, maybe I was bordering a little on the ridiculous. Holy cow! 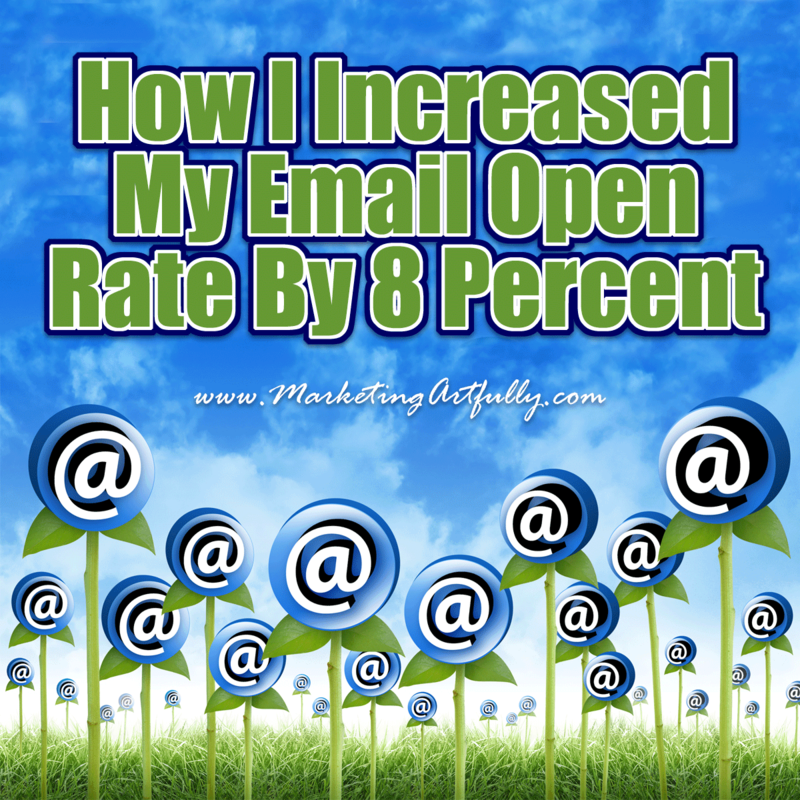 Open rates were higher and more people clicked. Sell stuff… here is where it gets tricky. Yes! I want to sell things that I think will be beneficial to my audience, but I feel like that is the job of my website more than my email newsletter list. Maybe I am wrong, but this may have to be my next experiment as my goal on my newsletter list has never been to sell, sell, sell. One thing I heard a lot was that since they were so information filled, people were saving them “to read later”. Oh crap! I have a read later folder and have to say that I rarely get to it (like never). So if my peeps are popping open my emails and then getting overwhelmed, I am thinking that they are reading when I am actually just going into the “maybe someday when I have enough time to look at this” file. So here is something that I got anecdotally. The people who like the pretty emails are generally reading them on computers. I read my emails on my computer so they don’t seem to “busy” or hard to follow. My email guy is younger and more technology based than most of my readers so he is probably checking his messages on his phone most of the time. YES! I get it, lots of people read their messages on their phones now, but my target subscriber is a 45-65 year old professional woman who is super busy and who probably does read her emails primarily on some kind of computer or tablet. This is one comment that I got from a gentleman who is not my ideal reader…”I like the new emails, easy on eyes but not interested please unsubscribe.” Ironic that, I DID get to his inbox, but he didn’t like my content so it didn’t matter anyways. How Does Your Audience Read Your Message, Phone or Computer? 72% of my readers online are using a computer and that is where I get my signups so it makes sense that they are probably reading my emails on their computers too! It also makes sense that not as many people are reading my web content on phones because most of my posts are long (over 1,000) words and are graphics heavy too. I got an amazing email from Joe Dively, who did an email marketing campaign for over 10 years. His degree is Security Risk Management so he is pretty proficient with statistical analysis. His personal website is http://joed.com. My emails would have 4 to 7 paragraphs each covering a specific point, most of these points had a link embedded in it for an action or for more information. The number of links didn’t seem to matter so long as they were appropriate to the email. I also allowed sponsors for the email at the top and bottom. These were clearly labeled something like this. I would like to thank XYZ company for helping to sponsor this weeks newsletter and they a text link by that sponsor. I saw no statistical difference in actions with or without those 2 sponsor links. So all this was brought about by my email marketing deliverability guru, Chris Lang. Chris REALLY cares about how email technically works and how many get to the primary inbox as opposed to hitting the promotions tab in Gmail. Every week when I sent out my emails, Chris would email me back with helpful information about how I screwed up that week’s deliverabilty… HA! If you would like to learn more about this, please check out his awesome article, Top 10 Gmail Promotions Tab Myths Debunked.